If you are dealing with PixelArt on the Internet, you will have fret over the new versions of Firefox, Opera and Safari already. The problem puppy: zoomed screenshots or bitmaps are rendered bicubic, which means a rather "unlovely" anti-aliasing is applied. (read: it looks like complete and utter crap). Unfortunately, there are no options to turn this off just yet. Pixel-enthusiasts continue using the older versions of said browsers and should be sending hatemail to the Opera Team. AmigaMemo.com will fix the issue of aliased screenshots as well. You want ORIGINAL games instead of emulation? Welcome! The small partnersite of this fine AmigaMemo.com Game Museum, www.AmigaMicro.com CLOSED offering you hundreds of amiga classics in collectors condition, has been relaunched and redesigned with a shiny new look. If you are looking for nice and rare Amiga games for fair prices a visit is well worth it. takes place in a small town in Lower Saxony. 35 years of Computer and console gaming. Starting with arcades of the 70, over 8-Bit and 16 Bit computers / consoles to the newest Next-Gen machines everything is set up for play. 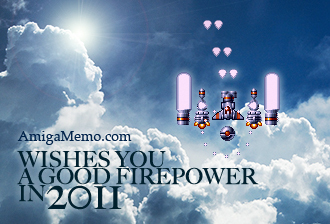 AmigaMemo.com wishes a happy new year and celebrates the !!! 1000th Game in the museum: The super rare UK version of ""The Great Giana Sisters"" (UK). [courtesy of my fine German friend Oliver [cebulba]. Yeah! and now on to the next 1000. While heading towards that goal there will be sweet new functions in the Museum like "related games", more exact overviews of used languages (games and their accessories / contents) as well as a separate game counter for each game page. It is possible to directlink to the AmigaMemo detailpages with photos and screenshots now. The accordant link can be found as a button at the bottom of each page. AmigaMemo is looking forward to meet old friends on the Breakpoint'07 - The worlds biggest pure demoscene event taking place from 6th to 8th of April - or in other words: 73 hours non stop fun! :) Happy Easter in Bingen near Rhine. Welcome to 2007! Despite the lack of recent news, working on the museum has been steadily continuing. If you are still looking for one or another Amiga Game to add to your collection, keep an eye out for the little Gem-button. Should one of these be around, you will be able to get the game directly from AmigaMemo's sister site AmigaMicro.com. Not having one over the eight yet? Go and try the new screenshot-quiz at www.amigamicro.com. Merry Christmas from AmigaMemo to all our users. Take it easy during the holidays, relax and enjoy some Amiga classics. Best wishes, phil. ...By the way: 50 new game pictures have been added! AmigaMemo celebrates it's first anniversary - time for drawing the balance: so far AmigaMemo proudly presents about 500 Amiga titles, with more than 400 hi-res gamebox pictures, countless screenshots and additional background information for your Amiga-retrogamer pleasure. Hall Of Light. From this day on, every game-entry is linked to HOL and vice-versa making it possible for you to accquire more game-related information easiley. Thanks to the HOL Team for their support.